Remember, paddle 100% of the time while riding waves! I have come up with a 2 unique designs, one of which is for 225lb guys, which is a 9’7” ,31 3/8” wide, and 4 5/8” thick. The other, for 260lb guys, is a 9’7”, 32” wide, and 4 3/4” thick. Even guys at this weight need to stay away from 10′. I have flattened the rocker on these because weight is like rocker. Now these boards will paddle fast and run down the line quickly. Now for guys weighing up to 300lbs or even more, I can make a 10’6” that’s 35” wide and 5” thick. Also, at my shop I have a 10’6”, 36” wide for guys that are 250lbs or more that are just learning. Now they can go out and catch a lot of waves without falling all the time. I am excited about having a rental for bigger guys so they can go out first time and have a lot of fun. One thing nice about the customs, I can make any size or design that you would like. These boards turn 7 inches shorter than their length and are extremely fast, hardly any tail rocker. Teaching people Stand-up Paddle surfing on a board that is 11’6” x 28 ½” is a nightmare and dangerous. The narrow board wears out your ankles and you are toast in 20 minutes. The narrow board also causes you to fall a lot more often…not good! I have made these boards wider for increased stability and shorter for better control. These boards have more nose kick so they don’t pearl and the fins are moved up further than industry standards, allowing the board to turn quicker and easier. 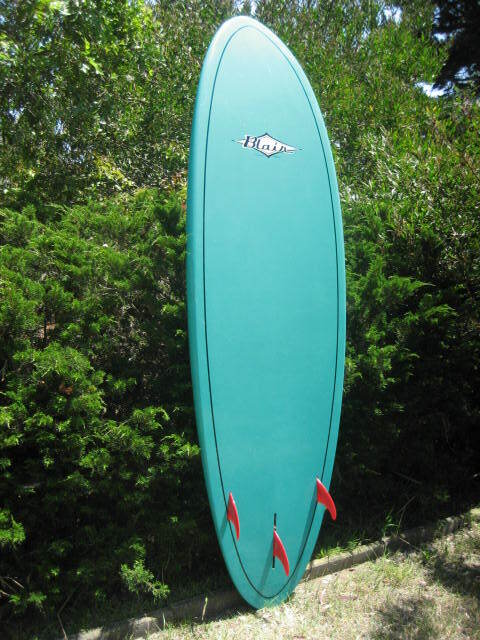 The 10’ 1” is perfect for 210lbs on up and the 8’ 11” is for 200lbs on down for SUP. I have been watching people try to stand up paddle surf with long, narrow boards and it’s not working. My boards being wider allow you to stay in the water longer without fatigue. The shorter board is faster and turns quicker and easier. Makes late drops safer and easier. These boards are sandwich construction which are lighter and stronger than the hand laid up style. I have made special fiberglass fins which give you more punch out of your turns and they also have a thin windsurf type foil which makes them faster too. 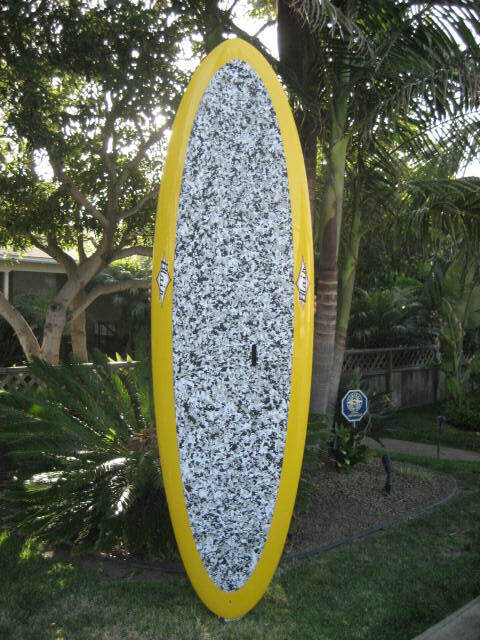 The round pin make the board go rail to rail faster and smoother and hangs in better in bigger and hollower surf round pins are a must on wider boards and hides the thickness when riding it. Guaranteed to be more stable, and be more maneuverable in surf than all other stand-ups! I can make this board any size depending on weight, age or injuries. The fun thing you can do with board is put smaller fins all the way around and be able to slash 360’s with it. This board can be built any size. Example 33” wide 4 3/4” thick for a 220 pound guy. I don’t have thick boxy rails on any of my boards. We are looking for a high performance board, not a boat!!! We are putting 3” fin the back so you can slash 360,s. We will be doing a tutorial video on this so we all can learn how to do this maneuver. Great fun. I have a slight concave 3/4 the length of the board going to flat in the back for release in the tail. The round pin is your V. This way you can get vertical easier than the old deep V with deep double barrel concave. I do not have a lot of tail kick. This makes the board much faster. Remember we have our paddle to snap our turns with. 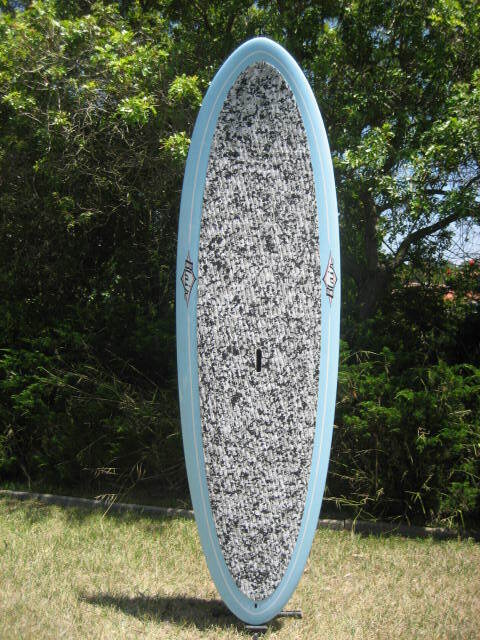 Fin placement which is confidential is a major factor in high performance stand up paddle boards. The shorter stand-up is faster; turns quicker and is way more manageable than bigger ones. Once you ride one and try to go back to your 10′ it gets in it’s own way and you screw up your ride. They really don’t paddle that much slower than the bigger ones. Turning the board to catch the wave is way easier an quicker. Dropping in late is way easier and being smaller you can on it quicker and rip the wave way – way better. I have full concave going into double concave with “V” in the tail. This makes the board faster. I also have a speed spot between your feet so it is faster. Very important is that I have softer rails going back further so the board is smoother and more maneuverable. 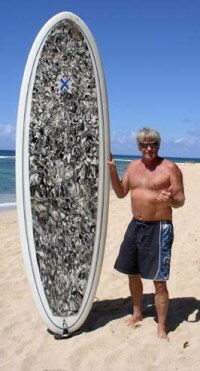 My fins are moved up 4″ further than all other manufacturers so the board is quicker turning. These boards are big so you have to totally re-think fin placement. The back fin has a 10″ box so you can cluster the fins together for tighter turns in smaller surf or move the fin back for overhead waves like a semi-gun. The adjustable gives this board a much bigger range. I have found that 3 fins (4 – 5/8″) all the way around works best. 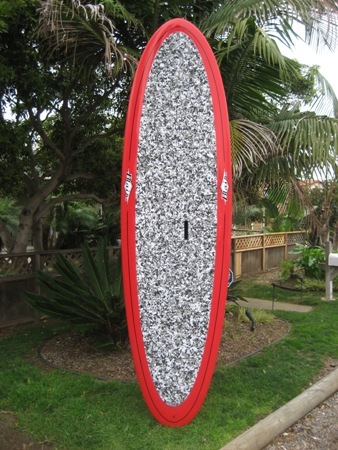 The 2 + 1 has small fins on the sides which gives no punch and the 9.5″ center fin in the back makes it stiff turning. The round pin is 3 times better than a squash or swallow tail because round pins eliminate the 12″ of straight rail in the tail right where you need curve to get tighter and quicker turns. The round pin rolls into turns quicker, smoother, and hangs in better when going fast. Ridding smaller boards has made this incredible sport way better than it already is. Thanks for the aloha Laird!!! Just try one and you’ll never look back. Take one for a spin at cardiff reef.